You know, we had a week of crazy nice weather? Cookout on the beach kind of weather. Well, it's back to snowing now, but while it was nice I got it in my head that I want to grow some veggies this summer (I actually go through this phase every year about this time but always forget), which I have never actually done before. I have a sense that it is going to be a bit of a challenge- for one thing it's going to have to all be in containers. Also, I live under a rather dense canopy of trees and there's not much in the way of light. Also, you know... it rains constantly here. Plus, bears, deer, rodents oh my. Etc. There's a ton of information out there about veggie gardens but very little specifically pertaining to this area. I have a pretty green thumb so I think I'm up to it but I could definitely use a few pointers, especially tips on what might possibly survive and grow on my very dark patio. I can start stuff indoors anytime, but my house has even less light- we have to have lights on inside even during sunny days. p.s. Nobody had better suggest I grow turnips. I f-ing hate turnips. 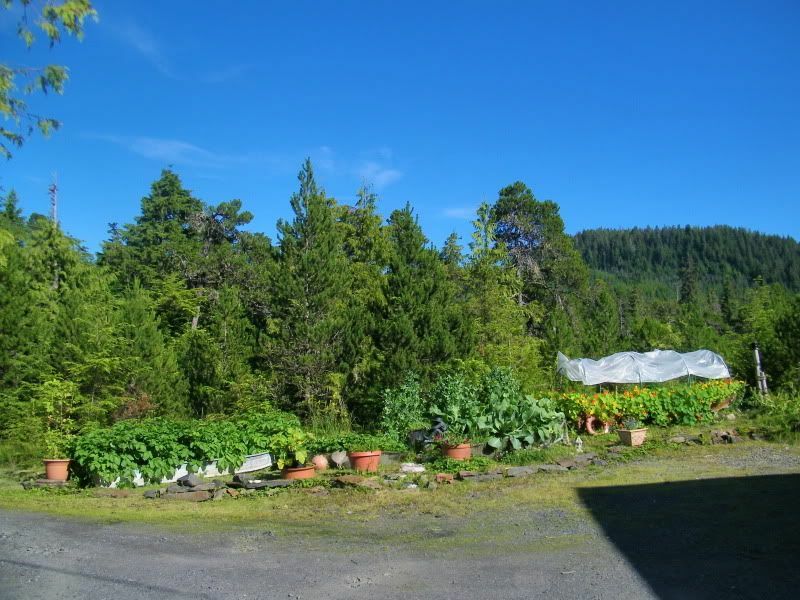 I think GrammasCabin is our resident expert for all things gardening/harvesting in that area of AK. You might want to send her a message, not sure if she posts very much here anymore. 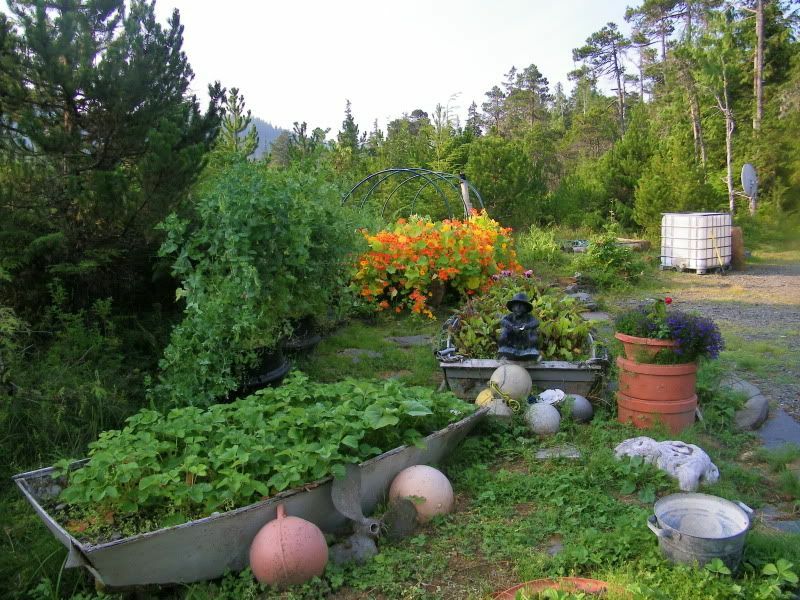 Try doing a search on this forum using all configurations of Alaska and gardening too or contacting your closest garden club or Master Gardener site. Hopefully someone else will chime in to help that will have direct experience. Hi freezengirl! I just spied this thread and thought I better jump in and help this gal. I do all my gardening in containers of whatever I can find, derelic skiffs, log slabs, timbers, whatever holds dirt. There's no dirt on my property, half muskeg and half beach so I make my own. I've finally learned to only mess with what grows in abundance here. Potatoes - the store-bought potatoes have more pesticides than any produce on the market = ick! I can the new ones and store the later ones to eat fresh through the winter. Peas -I love peas! Oregon sugar pods can be started soon's the ground thaws and muched on right up 'til October and what's left froze for stir-fry's in winter. Shelling peas are well worth the space, they love it up here! Eat as you go and freeze the rest. Carrots - you'll grow the sweetest, crispest, most delicious carrots up here on the planet! Salad - throw them lettuce, radish and spinach seeds out soon as you can dig in the dirt a bit., radishes too. You'll have fresh salad right up through October. All other roots & cool weather crops - beets, turnips, kolarobi do good here as do things like swiss chard & cabbage. I have coleslaw & sourkrout all year long. I compost, compost, compost all year long. Also drag truckloads of seaweed, alder leaves and whatever manure I can find on the island to my gardens. I use boats, logs, timbers and log slabs for containers and put them wherever the sun shines. pvc pipes stuck into the sides of an old skiff make good framework for a visquine greenhouse when it's still cold. 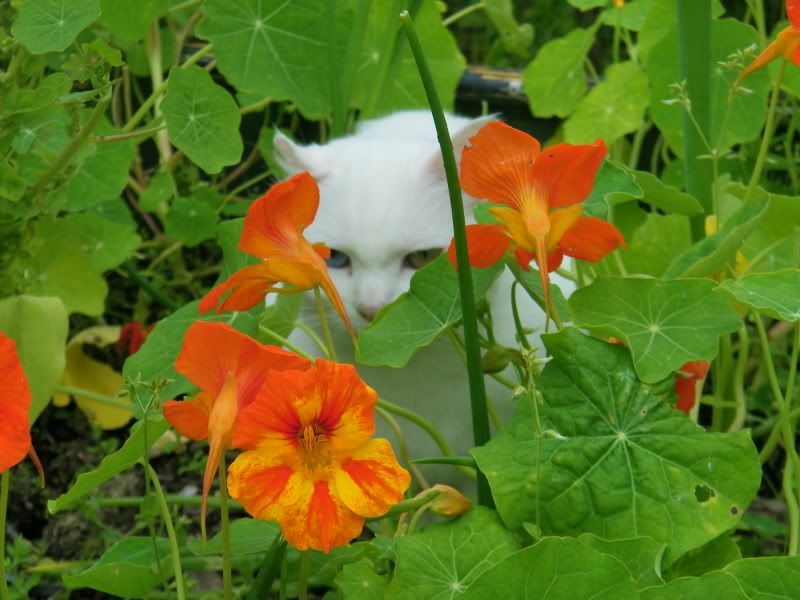 So do nasturtiums ( great in salads & the seeds make great capers) and Peal. Most of all, don't forget what's growing wild out ther just for the taking. Look....you'll find nettles, goosetounge, beach asparagus, blueberries, cranberries, huckleberries, too many to list! You're smack in the middle of God's supermarket. 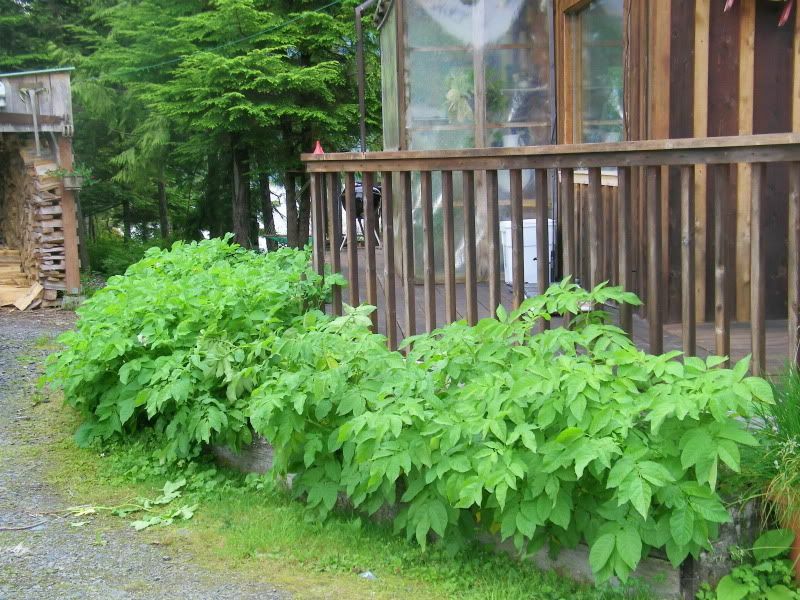 Lady Auke, Gramma's cabin is right...the seed potatoes she sent me last spring did great as did the nasturtiums I can't really add much to the great advice she gave here but I wanted to say welcome to SE gardening. I garden in SE when I have the time, and yes, containers are the way to go although I've had good success with raised and well-amended beds with some crops. Getting enough sun is crucial as is rain protection for certain plants. Keep in mind that heavy rain leaches out nutrients which might have to be compensated for. Best of luck, and once you have a homegrown potato you'll never want to eat anything else. Thanks guys! I really want to try the potatoes and carrots, and the sugar peas too. I will do some research but I was wondering- should I start them inside, and if so- when? I would love to compost but I was always taught that it would attract bears, and I live far enough out of town that that is a concern. I can do seaweed though, and I have pretty much unlimited access to coffee grounds. Do I just sort of dump that stuff on top? We love going foraging, too. I have tried, but I just can't make myself like the taste of beach asparagus. This year I want to learn to make jams! Making jams and jelly is a lot of fun! I used to make cases and cases every year because I enjoyed it so much though I never actually used it myself. There is just so much satisfaction in looking at the pantry shelves full of produce in bright, colorful jars that were put up by dint of your own labor. That is one thing that I love about Alaska, many people are into canning and producing their own food. In the lower 48 the skills are becoming a lost art. I loved being able to pass along the time honored traditions that were taught to me by a generation that were dependent on knowing how to put food by. I'd start the carrots inside but it isn't necessary with peas and potatoes. Peas seem to grow so fast in SE that it's unreal. Don't see how it could hurt to start a few inside though if you want an earlier crop. If I had the time to seriously garden in SE I'd invest in some sort of starter greenhouse. Compost--I'm not real great with that because I live in bear country too (both places), but so does GC and I'm sure she has some good tips for bear-proofing compost. We've got a bear-proof dumpster for fish processing waste and although it keeps the bears out it doesn't keep them from coming around trying to get in. I'm sure there's a similar product for compost. we've actually had some luck in SE with cherry and apple trees but I'm guessing that these trees won't reach full maturity. I've been doing some composting and if you don't add things that animals like you should be able to do fine. Seaweed, grass, coffee grounds, sawdust, are great. Don't add fish, table scraps, or anything else a bear would find attractive. You have to mix it in the right proportions. You need access to either dry grass or sawdust or straw or something for the brown mixture. GranmmasCabin-those pictures are so pretty and full of light and colors! I love nasturtiams too and what a beautiful cat! 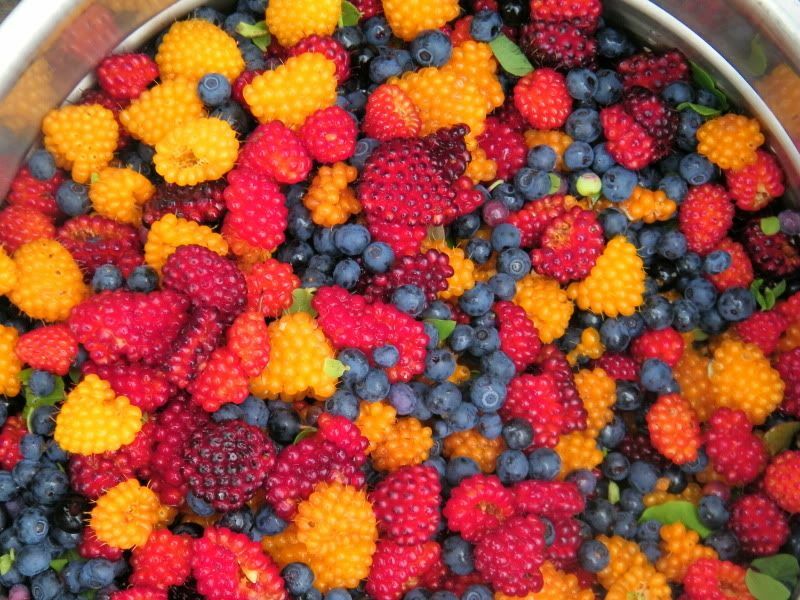 Are the yellow berries unripe raspberries or another type of berry? I'd start the carrots inside but it isn't necessary with peas and potatoes. Sorry Met, if she tries starting her carrots inside she won't have any later to eat. They get sown directly into the ground soon's it's workable. I jump start my cabbage, broccoli & brussel sprouts inside right about now but for fall harvest you can wait and sow them directly in the garden if you want. gobrien - the yellow berries are salmonberries as are the red-orange berries, usually the first to ripen around here, aren't they pretty? ladyauke - I forgot to tell you to save room to plant garlic this fall, it does great up here. I haven't had to buy garlic for years, I just replant cloves from the previous year's harvest and I'm good to go again. Have fun!